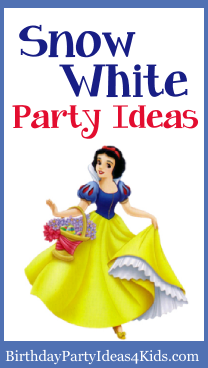 Snow White birthday party ideas including ideas for unique party games, invitations, decorations, activities, food and more! Find the ideas that fit your style and budget and put them all together for a quick and easy party that everyone will love! Find shiny silver foil cards and cut out a handheld mirror shape out of scrapbook paper to glue to the card so it looks like a mirror. Inside write "Mirror, mirror in my hand ... who's party is going to be grand?" Buy yellow cards and cut out blue scrapbook paper to cover 1/3 of the card. Glue red ribbon on the edge of the scrapbook paper and glue on a little red bow. If you will be renting a bounce house ask for a castle. Fill a kiddy pool with play sand and hide lots of plastic jewels (see craft idea above) and / or play jewelry. Give each child a plastic scoop or shovel and tell them to dig like the 7 dwarves for jewels. You might want to place a few special jewels in the sand that are worth an extra prize if found. Buy lots of foil wrapped gold chocolate coins and hide them around the party area or outside. Give each guest a paper bag and tell them to find as many gold coins as they can. Let them take them home as favors after the birthday party. Tie yellow helium balloons with a few blue and red balloons mixed in to the mailbox so guests will know where the party is located. Cut out different shapes of footprints for each dwarf out of construction paper and tape them down along the walkway to the party. Decorate the party table with mostly yellows and touches of blue and red. Decorate the party area to look like the forest in the movie. On the party table drape yellow tulle from the corners and embellish with artificial flowers. Place blue birds around the party area. The dwarves in the Snow White movie dug for jewels. See the "digging for jewels" game below and then use the jewels to make a cute picture frame. Buy wooden frames at a craft store (Michaels sells them for $1.00). Let the guests paint their frames with yellow, blue and red (or any color they choose) and then attach large plastic jewels to the frame with hot glue (make sure an adult handles the hot glue gun). 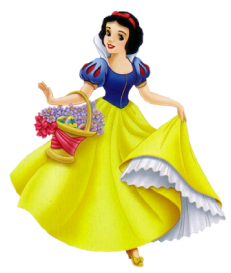 If you are having someone come dressed up as Snow White take pictures of the guests with Snow White, or if you have a Snow White costume let the guests take turns dressing up like Snow White and take their pictures. If time permits have a helper run them to 1 hour photo and at the end of the party place them in their picture frames to take home as a favor. Or mail the pictures to the guests with a thank you note. For more craft ideas see our Party Craft page. Write the names of the seven dwarves on large stickers (one name per sticker) plus the names of Snow White, the Prince and the Stepmother. If you have more then 10 guests duplicate some of the names of the dwarves. While guests are arriving place a sticker on their back - make sure they don't see the sticker. Then have the guests go around and ask yes or no questions until they guess which character they have on their back. The names of the seven dwarves are: Doc, Grumpy, Happy, Sleepy, Bashful, Sneezy and Dopey. Blow up several balloons to about 4 inches and tie. Divide guests into 2 teams and give each team a broom and 3 balloons. Have them one by one herd the balloons to the other end of the room, around a cone or chair, and then back to the starting point. They then hand off the broom to the next person. The team with all of their players completing the course wins. If a balloon pops the person must return to the start and begin again with another balloon. Play Sleeping Tag just as you would Freeze Tag. When "it" touches a player then the player must freeze and pretend to sleep until another player touches them. A new "it" is chosen when all the players are tagged at once. For more fun games see our Birthday Games page and our Games for Girls page.